the scent of green bananas: bloodshot eyes and a little green around the gills. Posted by santos. This entry was posted on 20050621 at 4:55 PM You can skip to the end and leave a response. Eweekk..!! 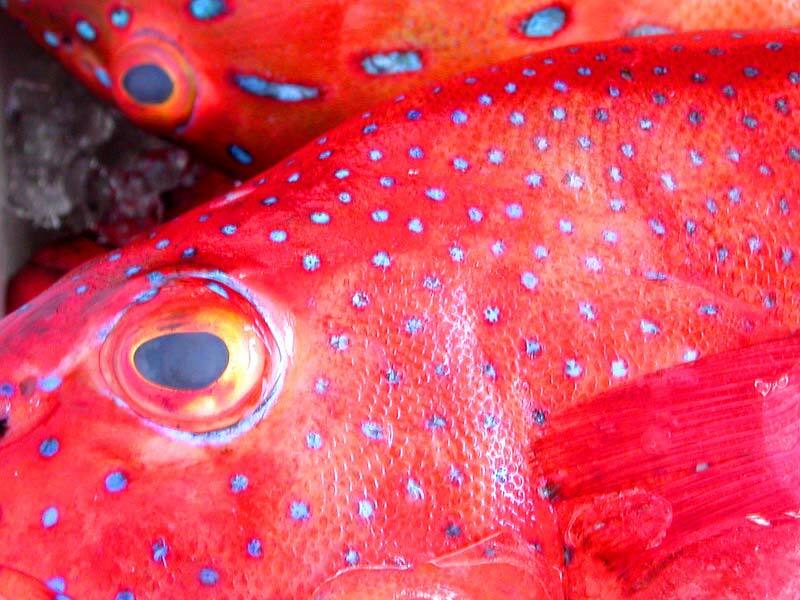 what a colored fish..!! Fish head eater here, growing up on the island, you gotta be. But not only am I a fish head eater, I'm also a fish eyeball popper. Such pretty colored snappers! I love fish heads (And yes: I am a self-avowed fish-eye popper.) - especially if they're cooked as sinigang sa miso. Yummers! Oooh, I'm a hater, baby. B-e-a-utiful shot, Santos. Gorgeous color! They'll be yummy in sinigang, I bet. I do declare I eat fish heads. Preferably in curry. i can't believe there are only two haters in this fish head strewn world. c'mon now, feel the hate. YUM! Salmon Fishheads in miso based sauce with tofu is a fave. Makes me want to sing "Fishheads fishheads eat them up yum!" that weird novelty song by Dr. Demento! hi reid! those are my drinkin' buddies. ha. i'm a fish head eater. i said two because i wasn't sure what your answer was, nor mrs.t's--i figured there was a 50-50 chance one of y'all would be a hater. eater! There is this restaurant we go to that serves fish heads stir-fried with black bean and bitter gourd, sounds weird, but it taste fantastic! I was on a tour with a bunch of bikers to the Izu peninsula to the south of Tokyo where we all stayed at a small seaside inn. After we'd had most of our meal a whole roasted tuna head comes out and it was huge. Apparently quite a treat so we should have been more honoured than horrifed. We picked away at the head and it was delicious, especially around the cheeks. Then we listened to the neighbouring room sing what were apparently old sea shanties or something. Where was I, oh yeah head eater. PS love whitebait and that's head and all. ooh, yeah, i am with ladygoat with the shrimp head sucking and with you on the prawn head eating. my favourite part of sweet (raw) prawn sushi is when those little buggy-eyed heads come back, all golden fried and sitting on top of a greaseless piece of white paper. I like eating shrimp heads! Fish heads... not so much. The cheek meat is nice, but anything to do with eyeballs just squicks me out. But tiny tiny fish I eat head and all. Because I can't see them looking at me. hi shukumei! i like whitebait and sardines, and anchovies, but any smaller and i start to get a little squeamish. i was actually going to blog about this teeny tiny fishling, but i have yet to identify what it's called in english. it's so small it looks like a skinny maggot with teeeeeeny black eyes. i like them okay, but i have a hard time eating them because those beady black eyes set against an albino white body sort of freak me out after awhile. just staring at me. looking straight into the dark abyss of my gullet. eeek. LOVER NOT HATER the cheeks have great taste! i know what fish you're talking about! i usually eat them as a salty condiment for rice porridge. I agree with Saffon...fish head curry! BTW...Did you know that at Yanagi Sushi you can order steamed onaga head if they have it? It's really good. by the way I was in athens 2 weeks ago and I took out two american girls out to my favourite sea side tavern and ordered a huge bream grilled served with olive and lemon! I was just abou to eat the head well I donot need to go fully descriptive here;; both just said YEUCK! oh well wonder what they are missing!